When, at the beginning of Third Year, the choice had to be made whether to do woodwork or metal work, the majority of 3A wanted to do woodwork. But when Mr. Tufnell dropped a few hints about a kart project, he soon had a full group of metalwork students -- or was it prospective Graham Hills? Often the metalworkers were jeered at by others who were convinced that the project would never get off the ground, some wondered if "a tent-peg might help". 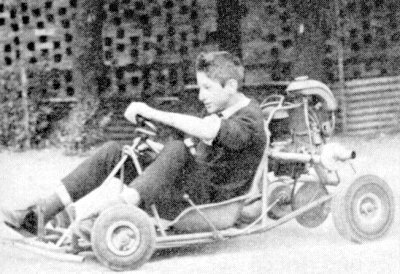 The scoffers were ignored, the work pressed on and soon the kart began to take shape. The casting of the aluminium wheels was by far the hardest operation. The steering and front-wheel linkage was the first of the technical jobs tackled. Progress was slowed by the fact that, although ordered, spares and parts were not forthcoming on schedule. The seat was modelled out of fibre-glass and, in general, the design fitted anybody. E. Czrko on a test run. The 98cc. 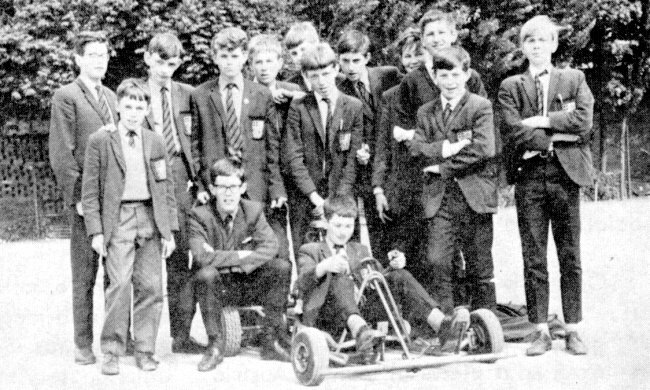 Villiers engine was fitted to the kart and, after some adjustments had been made to get the correct level for the carburettor, the fateful day for a test start arrived. The rear wheels were jacked up and the engine started. By trial and error we began to get the engine to fire and when it did, white clouds of carbon monoxide nearly asphyxiated everyone near it. From there things progressed to tuning the engine and making final modifications and any necessary adjustments. The kart was ready for trial on the track. Mr. Tufnell, to safeguard us, thought that he should have the first ride; bravely he took the wheel and roared off.... After about five laps he slowed to a halt ---- to each one's mind sprang the question, "What's wrong now". Only a minor repair was needed and soon all was well again; the kart roared off with Mr. Tufnell still at the wheel, just to make sure everything was really alright, it was -- but not for long. After a few test drivers had tried their hand at the wheel, the famous N.R. (it would be indelicate, perhaps libellous, to mention his name) took the wheel. He decided that driving was very boring and on the right-hander, just for variety, headed for the metal post in the far fence. I have no doubt he found the experience exhilarating, but the kart did not take too kindly to it. After undergoing major structural and mechanical repairs, the kart, Mk 11, boasting now a brake and clutch, reappeared on the track. Praise must be given to Mr. Rayner who helped no end with the technicalities of the kart and made possible the production of a smooth-running, efficient machine. The Mark 11 led a charmed life, including several near misses of the goal posts, and it was on this version of our kart that most driving was done. All good things must come to an end; so it was with Mark 11. This time it was K.B., already notorious for his hit and run antics, who, in trying to cross a rut in the Redgra, succeeded in having the kart again back on the ramp. After very many hours of strenuous repairing and reconstructing, the Mark 111 was evolved; this version was short-lived as the frame was badly strained. At the moment the Mark lV is being constructed, the original design has been modified but, in the main, it is being built from the repaired and reassembled parts of the earlier models. 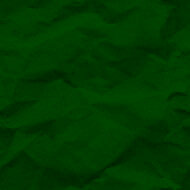 It should not be long before it makes its public debut. When it does so, should it not bear a name? How about "phoenix"?